OK — now I will take out the overflowing trash; now I will clear the sink and do the laundry. And, for something more fun, but no less cathartic for me: sharing a day in my life as an English teacher. 7:12 a.m.: Leave the house. 7:47: Arrive at school. Happy it’s Tuesday, the day I get first period off! 7:52 – 8:43: Review directions for next week’s parent conferences, and spend way too long grading two essays. 8:48 – 9:32: Class #1 today is ninth grade; I administer a quiz on the Prologue of Romeo and Juliet (two students are absent, to my dismay); they sign up for parent conferences. After the quiz, I institute a seating chart for the first time; they’re a great class, but have been way too chatty lately. We go over questions from last night’s reading, and then get to the good stuff: acting out the scene where Romeo spills his guts to his cousin Benvolio about his unrequited love for Rosaline. They giggle as we discuss what chastity means, and a usually reserved student takes her role as the woebegone Romeo quite seriously. I’m impressed! 9:32 – 9:45: Gather up laptop, zapper, and 27 Oedipus books on a cart to wheel to the next class. Write the day’s agenda and HW on the board. Oops — I forgot the wireless doesn’t work in this art room. Now I won’t be able to check their Odyssey books in or Oedipus books out. 9:50 – 10:30: Class #2, tenth grade — out with the epic hero, in with the tragic hero. Getting the books to and from the students is a production anyway, because they need to remove copious amounts of Post-its from their Odysseys. But I’m glad they’ve been annotating their reading! They sign up for parent conferences in the meantime. We stage the first scene, and get our female Oedipus to stand on a table to address the citizens of Thebes. A funny kid races to lie down at the foot of the table, i.e. the palace steps. They get the story’s first moment of dramatic irony! 10:35 – 11:14: Since my schedule is different every day, I nearly forgot I had a third class in a row to teach. Another 9th grade class. They get a slightly longer quiz on the Prologue to “make up” for word traveling from the first class. Again, someone is absent. Make-up quizzes are annoying and possibly useless. This class also does a nice job with acting out the scene. Our Romeo is a lanky boy this time, and he drags his feet dutifully to convey his mopey mood. We also have time to talk about oxymorons, and how they help us think about the play as a whole. A student hands in an essay that’s two weeks overdue. I hope I don’t lose it. 11:20 – 11:36: Wheel the cart of books and laptop to a nearby classroom that does have a wireless connection, and check books into the system. Return books to the book room, and load up with enough books for this afternoon’s class. Time consuming. 11:42 – 11:50: Back to the office to take care of housekeeping: attendance for this morning’s classes; check e-mail; fix a mistake I made on turnitin.com. 11:52 a.m. – 12:30 p.m.: Grade and enter 47 Prologue quizzes over lunch. I love the instant gratification of grading multiple choice. 12:33 p.m.: First bathroom break of the day. 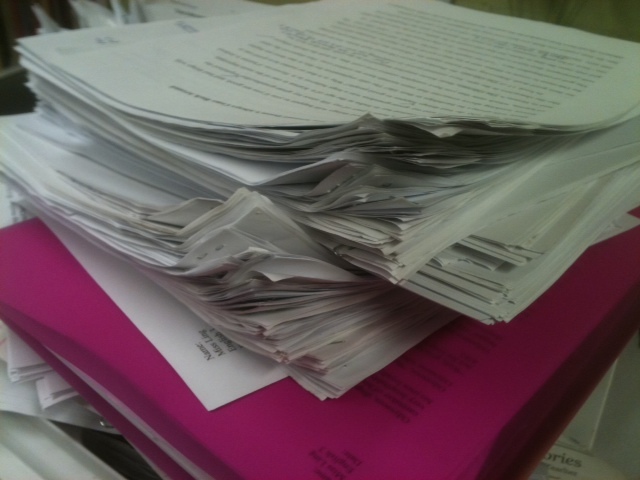 12:38 – 1:18: How did it take me so long to grade 1.5 essays before class? 1:22 – 2:02: Class #4, another 10th grade group; this time, I can get on the wireless to check their books in and out. A gift: Someone has left a model of a skeleton in the room. The kids can’t resist touching it and puppeteering it; we must use it in our class performance! Five girls and one boy lie on the carpeted floor to play “suppliants” — citizens of Thebes pleading with Oedipus to rid the city of a plague. The skeleton is also given a suppliant pose, and helps us show this plague is BAD. 2:05 -2:16: Return books, and load the cart with new ones. 2:20 – 6:00: This part is murky to me; I spent no more than ten minutes talking to the people in my department, but somehow, 3.5 hours passed as I graded five essays; edited a study guide for tomorrow’s 10th grade classes; and made sub plans for tomorrow. As usual, preparing sub plans took a lot longer than it should; I was foiled twice by a broken elevator (it’s hard to cart stacks of books down stairs); two more trips to the book room; and two of two copy machines out of service. 6:33 – 8:4o: Dinner and decompression, i.e. watching the first half of This is It. My knowledge of and respect for Michael Jackson grows exponentially. 10:43 p.m. – 12:24 a.m.: talking to my fiance/working on this post! What does a day in your life as teacher look like? Thanks for participating! Signing out math textbooks once a year is an onerous task, I never considered how often English teachers have to do that chore. Thanks for reading and creating the prompt, Tina. One plus is carrying light paperbacks instead of heavy textbooks! I love this post! This was my favorite: “2:20 – 6:00: This part is murky to me; I spent no more than ten minutes talking to the people in my department, but somehow, 3.5 hours passed as I graded five essays; edited a study guide for tomorrow’s 10th grade classes; and made sub plans for tomorrow.” Because it sounds a lot like my 3:15-5pm time period, where I’m working, but it seems like nothing gets done, even though I am totally working most of the time. Thanks for sharing. I wish I were in the class with the skeleton!! !